Welcome to the 2017 Porsche Parade Art Show! Year-after-year the art show continues to grow and provoke growth in the level of work produced for Parade. It has been exciting to observe the growth of the event, and more importantly, the growth of the artists exhibiting at Parade! There was such an exciting and diverse body of works to exhibit to the PCA membership at Jay Peak! 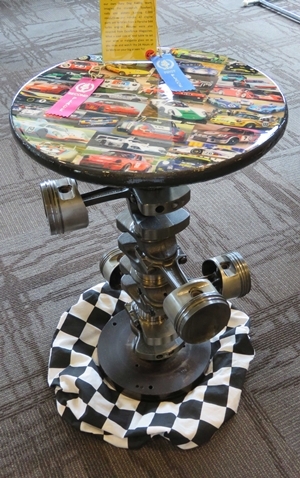 Again, I want to commend the artists that embraced the Recycle, Re-Use, and Re-Art category. 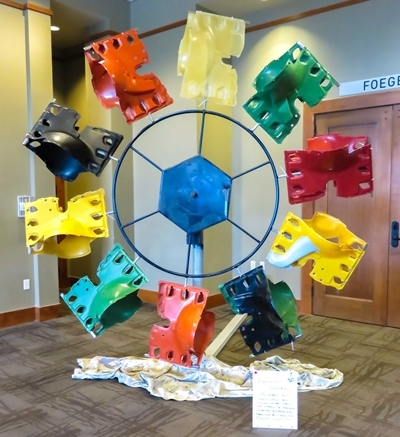 We exhibited several exciting large scale sculptures that exemplified the spirit of Recycle, Re-Use, and Re-Art. These works had a big impact me and on the voter’s! Damon Josz’s Ferry’s Wheel took home a 2nd Place People’s Choice Award, and Julie Baily’s Rev’em Up! which garnered a 3rd Place People’s Choice Award. Congratulations to you both for thinking big and thinking different! I look forward to continue working hand-in-hand with you, the artists and PCA membership, to make the Parade Art Show a showcase for amateur artists from around the world to exhibit their work inspired by the edicts of Dr. Ferry Porsche. 2017 will be my 3rd and final year as Chair of the Art Show. My heartfelt thanks go out to all of the parade staff, volunteers, and artists, for making my stint chairing the art show one that I will always cherish. Now, it is time to pass the baton. This is an exciting opportunity to give back to the PCA community and support your fellow artists and friends. If you are interested in taking the helm? Please reach out to me directly or to Ron Gordon. Ideally the candidate would be able shadow me for a few days in Spokane to get the lay of the land before taking over. I look forward to hearing from you. To register for the Amateur Adult/Junior Competition Categories, and the Art Show Reception. Please click on the link below.